Z-Cron is a central coordinating point for the scheduling or automation of software. Z-Cron can also be installed a system service. 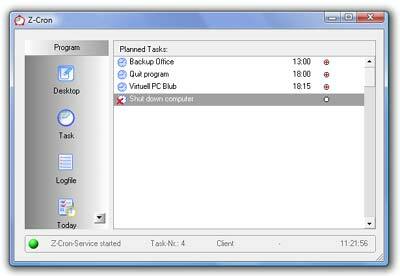 A system service is a program that starts automatically when Windows was booted, and runs in the background until Windows is shut down. With the Z-Cron scheduler you can have programs of all kinds started automatically by the system even if no user is logged in - for example nightly data backups with Z-DATdump. With Z-Cron scheduler you can execute tasks on your computer automatically. ...... With the Z-Cron scheduler you can have programs of all kinds started automatically by the system even if no user is logged in - for example nightly data backups with Z-DATdump. * Starting and stopping of applications (also with parameters). * Calling or saving of Websites. * Starting, stopping and monitoring system services (professional version). * Copying files and directories. * Archiving and compressing files and directories. * Switching computers in a network on or off. * Automated switching of electrical devices, e.g. with Z-USBswitch. * Establishing and disconnecting internet/VPN connections (Modem/ISDN). * Daily (every x days). * Weekly (every x weeks at a weekday you can choose). Online multiplayer game to make the funniest words to a random acronym. A searchable database of computer acronyms, abbreviations and initialisms. Reorganize your PC for better performance and data protection. Teen chat room acronym monitor helps decode your teens chat room language. The most comprehensive anti-spyware and security suite for your home PC. Create exe from MSI (Windows installer) files. Acronis Migrate Easy allows to install a new hard disk on your PC. Qweas is providing links to Z-Cron 4.8 as a courtesy, and makes no representations regarding Z-Cron or any other applications or any information related thereto. Any questions, complaints or claims regarding this application Z-Cron 4.8 must be directed to the appropriate software vendor. You may click the publisher link of Z-Cron on the top of this page to get more details about the vendor.